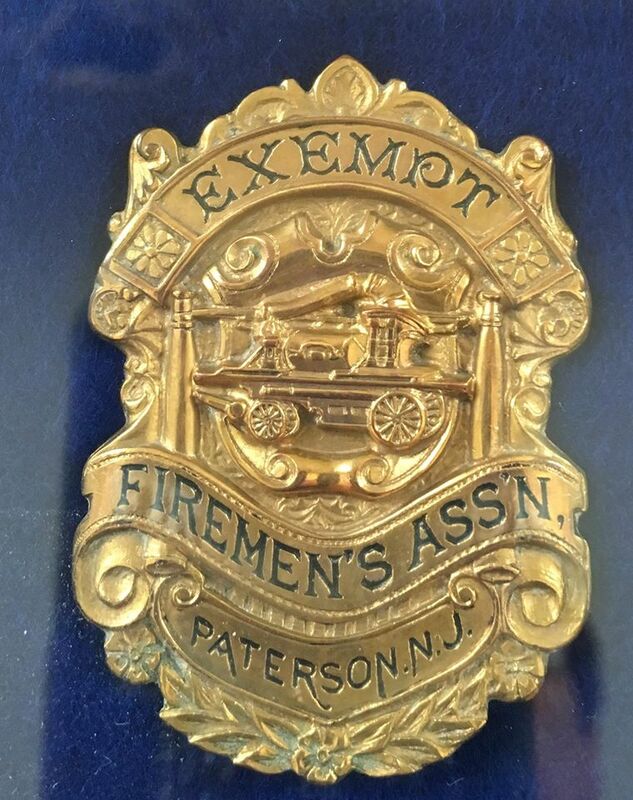 The membership of the Association of Exempt Firemen of Paterson NJ represents that class of men who, for nearly three quarters of a century voluntarily gave their services to save the property of their fellow citizens. The firemen aside from their self-imposed duty, have in a large measure done their share to develop the growth of the city. Many of our leading citizens who have identified with the pleasure of the days when they served in the ranks of volunteers and refer with pride to the fact that they are exempt firemen. As you see the aged men of today, some of whom are prominent in financial circles, successful manufacturers and prosperous merchants, it does not seem probable that the same men once "whooped it up" on the drag rope, while in an exciting race through the streets, straining every nerve to beat a rival fire company to the scene. ​Your are requested to attend a meeting to be held on Monday evening, November 27th, 1882, at 8 o'clock, at the engine house of Washington Steam Fire Engine Co. No. 3, for the purpose of forming an Exempt Firemen's Association. In response to this call, ninety-six exempt firemen met at No. 3's house. 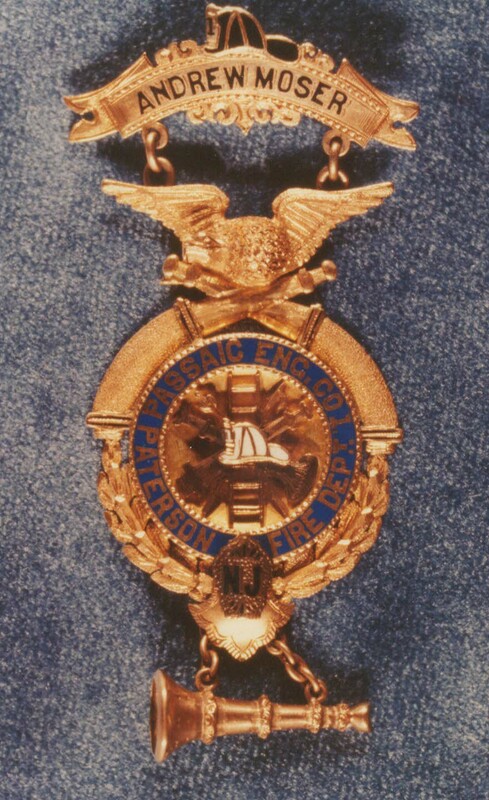 Ex-chief John McKiernan called the meeting to order and was elected chairman and John Johnson of Engine No. 4 was elected secretary. After considerable discussion regarding the plan of organization, a motion to make the association a beneficial one was lost, but it was agreed to form a social organization. Peter Firleds, Bartholomew Riley, Lambert Romaine, John W. Bensen and George W. Pollitt, Charles M. King, John Sullivan and John I. Spittel were elected the first board of trustees and Joseph Buckley, John C. McBride and Philip Chapman were appointed a standing committee. ​For a number of years the organization met quarterly at the several fire houses upon invitation from the companies. The quarters of engines Nos. 1, 2, 3, 5 and 4 and Truck 2 were made use of until 1888. During the month of October 1887 a fair was held at the Washington Hall, the proceeds netting $2000. ​John C. Donavan, Frederick Wieler, Isaac H. Garrabant, Joshua W. Harrison, James Rafferty. 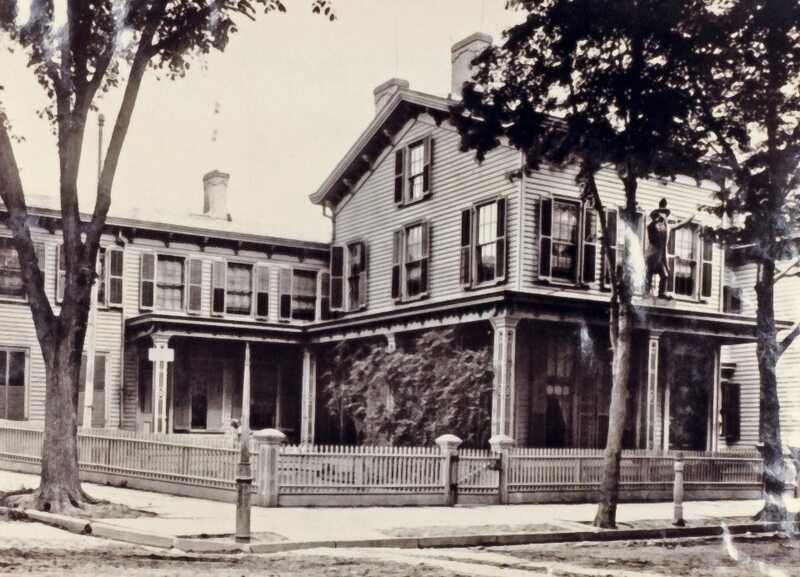 At a meeting of a number of the lady friends of the Exempts held the residence of Mrs D.W. Leonard early in May 1895, the question of forming an auxiliary to the Exempt Association was discussed and the plan being considered favorable an informal organization was agreed upon. At a meeting of the Exempt parlors on May 21, 1895, it was decided to make the organization a permanent one for social and beneficial purposes and tobe known as the Ladies' Auxiliary to the Association of Exempt Firemen. The membership to be composed of the wives, sisters and daughters of exempt firemen. ​The following were elected to the board of officers: Mrs. Daniel W. Leonard, president: Mrs. William F. Greer. vice-president: Miss Annie Barclay. secretary: Mrs. James Burgess, treasurer. Mrs. James Dunn, Mrs. John F. Murphy, Miss Sarah C. Spittel, Mrs. George D. Hopper, and Mrs. Jacob Reits were elected as the first board of directors. By the courtesy of the Exempts, the ladies were granted the freedom of the rooms for their meetings and social gatherings. As there are a number of talented musicians in the auxiliary, the visits of their ladies are pleasant events. As a rule their meetings generally close with entertainment. The quarters of the association in the two story and attic frame building on Clark Street with the two story extension on Smith street, comprise a parlor, assembly rooms, kitchen and engine room on the first floor: parlor, game room, billiard room, bath room, committee room and library on the second floor: wardrobe and storage rooms in the attic. Broad porches on the three sides of the building overlook a spacious lawn which is adorned by a pretty fountain representing a little boy and girl in negligee costume. The fountain was donated to the Exempts by Andrew Edwards. The members of the Exempt association are proud of their quarters, and justly so for the roomy mansion is a veritable museum of firemanic emblems, the walls of the interior being almost hidden with relics of all descriptions. 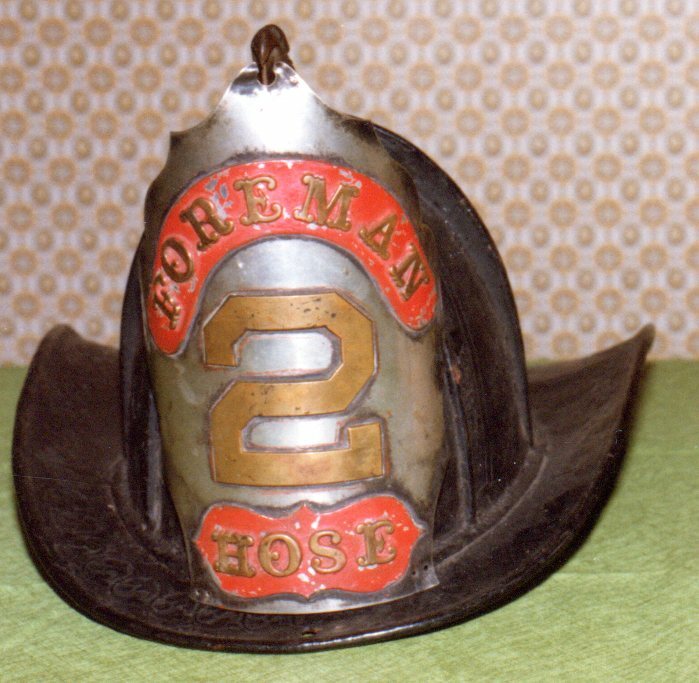 Faces of old-time firemen look down from their frames at trophies that are priceless to firemen and handsome to behold. 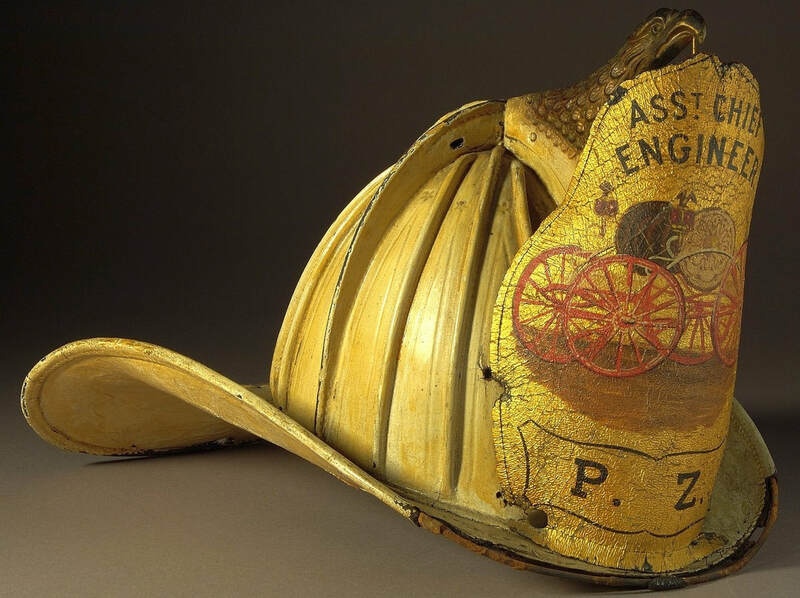 In this interesting collection can be traced the growth of the fire service from the days of the leather bucket to the powerful steam fire engines of today. As the old fireman wanders through the rooms where memories of the past these items recall to his mind. It pertains almost like another life to him as he compares service of the present time to the primitive methods of his earlier days. And yet the fireman rendered a good account of themselves in the days when they had to drag their engine by hand and work at the brakes until they were ready to drop from exhaustion. ​The writer of this sketch will endeavor to give a description of some of the principle articles, with a brief history thereof. Space will not permit a mention of every article in detail, although each one merits a separate notice. ​As the visitor enters the vestibule of the home, the first object brought to notice is a large frame (visible above at right) , presented by W.G. Grotecloss and containing portraits in uniform of the men of the paid department who succeeded the volunteers on March 23, 1890. With three exceptions, the group consists of the original list of paid men. Chemical engine crew: William B. Campbell, captain: John Breen, driver; Charlee Wiley, Charles C. Moore. Engine No. 1: Ernest S. Fields, captain; John Knaus, engineer; Andrew Knaus and Samuel Miller, drivers, Charles Sautter, William H. Brown, William J. Post, James H. Moser, John Chadwick, William B. Pohlman, Theodore A. Brown and Corneilus F. O'Neill. Engine No. 2: Floyd King, captain, George W. Dobson, engineer; Henry Nagle and George Sheldrake, drivers; Samuel Simonton, Reinhard Sherlock, John McGill, John Shaw, Marinus Heintjes, Thomas Fanning, Joseph H. Backlin and Peter Peter Dalinger. Engine No. 3: Christopher Cubby, captain; Henry L. Reed engineer; Leonard Hartly and Daniel W. Leonard, drivers; Edward Kerwin, James Irwin, Thomas G. Murphy, Richard Cubby, Neil Jordan, James B. Healey, Morris Rozelle and John Campbell. Engine No. 4: Patrick Sweeney, captain; Frank Costello, engineer; John Cluney and Peter Riley, drivers; Richard Moore, John Canning, Robert Dunphy, William Marshall, James Cullerton, Hugh Kennedy, William Morrison and John Marshall. Engine No. 5: William Cook, captain; William Farrell, engineer; John Lair and William Stanard, drivers; Charles Harrison, James C. Mills, Jacob Snyder, Peter Bradley, William Fielding, Peter Howden, John N. Messerger and Henry Snyder. Engine No. 6: Stewart Taylor, captain; Alexander S. Thomas, engineer; Allison Roswell and John Bowdon, drivers; Thomas Checkly, Josiah Darion, John Frolich, Frank McLaughlin, John J. Hart, Henry Titus, Henry E. Burton and James Thoms. Engine No. 7: William Allen, captain; John Bland, engineer; Arthur Rogers and George Bunting, drivers; Daniel Gregory, David Devine, George Mills, Thomas F. Hardiman, Thoms Fish, Benjamin Fanderson, John F. Melady, and Joseph Rogers. Engine No. 8: William Boyle, captain, Thomas Donahue, engineer; John Ellis and Robert Wright, drivers; Adam Banghardt, John Nagle, James Dunkerly, James C. Matthews, John W. Larue, Christopher Rafferty, Kevin Keys and James McMullen. Engine No. 9: John J. Condon, captain; Michael Halman, engineer; Louis Hanraer and Michael Farrell, drivers; Nicholas R. Snyder, George Sinter, John C. Carside, John O'Neill, Frank Revere, John Glass, John Madden and Michael Berghorn. Truck No. 1: Joseph Kearney, captain; David McAllistor, driver; Thomas Elvin and John Vesey, tillerman; James Jones, Richard Duffy, Joseph Hufton, William Lendrin, James O'Neill, Timothy Phalon, William J. Stewart and Edward Kilpatrick. Truck No. 2: John weber, captain; Martin Brandt, driver; John Specht and George Pfitzenmeyer, tillerman; Samuel Close, Gustave Specht, Charles Farrenbach, George Muth, Albert Mercier, Joseph Mellor, Thomas Armstrong and Albert Weber. ​Truck No. 3: Edward J. Coleman, captain; Abram Perrius, driver; Nelson C. Norris and Harry Lister, tillerman; James H. Coyle, Nathaniel C. Quackenbush, William R. Close, John J. haley, George Carr, Christopher Murphy, Walter Deveridge and Henry M. Butler. During the volunteer days the firemen were frequently called upon to assist churches, hospitals and other institutions and no reasonable request was ever turned aside. In many instances the several companies would engage in pleasant rivalry as to which could render the greater aid. In a large frame in the vestibule of the home the following resolutions, which are handsomely engrossed, illustrate the open-hearted hospitality of the firemen. Nearby is a large crayon portrait of William T. Hayes, an assistant Foreman of engine 4 in the sixties. A large steel engraving of a young girl confronting two pet dogs and entitled "Her Only Playmates" completes the list on that side of the wall. ​​On each side of the door leading to the parlor are two large battle axes presented by the exempt firemen of Long Island City. 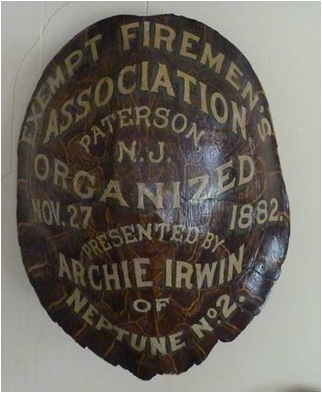 Suspended over the axes is a large turtle shell, presented by Archie Irwin, of Neptune Engine No. 2, which is agreeable reminder of the famous turtle soups and other "cook-ups" that were in vogue in the volunteer days. ​An incident connected to the "cook-ups" as these affairs were termed is well worth relating here. A party of gunners returning to an engine house from a pigeon match decided to have a stew. A simple-minded fellow at the house offered his services to pluck the birds and after accomplishing the task he placed them in the boiler, without further dreening. The serious offense merited some punishment, so a court was organized to try the thoughtless cook. After due deliberation he was found guilty and sentenced to be shot. The guns were merely loaded with powder, and at the word of command the guns were aimed at the ceiling and discharged. The result was very disastrous in the imagination of the victim who escaped from the house and ran down the street crying "I am killed: I am killed!" One of the first gifts to the exempts was an 8-inch fire alarm gong and striker, donated by the Gamewell Fire Alarm Telegraph company. As blows are struck off for alarms, the old vets are reminded of the remarkable fire alarm system of the early days. In those times, when a fire was discovered someone would yell "Fire" "Fire!" Others would take up the cry and so spread the note of alarm over the town. Everyone who could get at a bell rope would ring for all they were able and so add to the noise. The result would be a combination of sound that once heard could never be forgotten. The firemen would drag out their engines, but would be at a loss what direction to take, unless the flames had attained sufficient headway to guide them on their way, The firemen would generally consider the direction the greater volume of sound from criers as an indication that the fire was in that section but it often happened that they were wrong in their calculations. ​On entering the parlor nothing but a roll top desk indicates that it is used as a meeting room. Brussels carpet covers the floor, lace curtains hide the windows and portieres separate the parlor from the assembly room. ​Suspended from the ceiling are the signal lamps of Engines 1, 3, 4, 5, 7 and 8 and Truck 2. Handsomely carved marble mantels lend a pleasing appearance to the room while an elegant and costly upright plane comprises part of the ​furnishing. While all of the available space in the room is used to exhibit relics, yet the whole are so placed as to lend a pleasing effect to the eye. 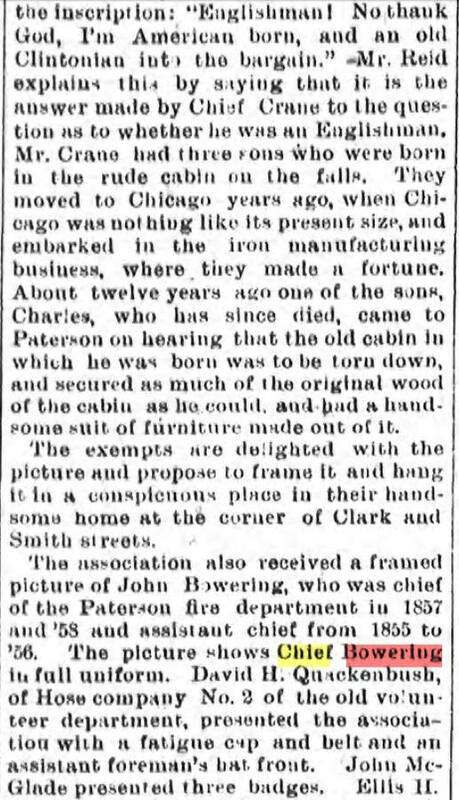 At the time of the last parade of the volunteer department on September 17, 1890, the Exempts has as their guests the Exempts of Long Island City and the visitors were so delighted with the hospitality of the local association that as a testimonial of their esteem they presented the local association with handsome fire front of exquisite workmanship and encased in a gilt frame of heavy molding about two feet in size. The upper part of the front shows a picture of two firemen indulging in a friendly hand-shake, while the lower part represents firemen working at a large factory fire. 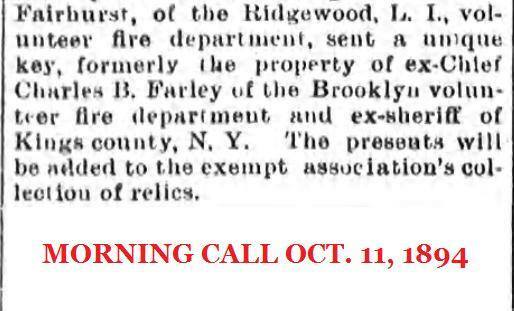 The inscription is: From Exempt Firemen's Association of Long Island City. 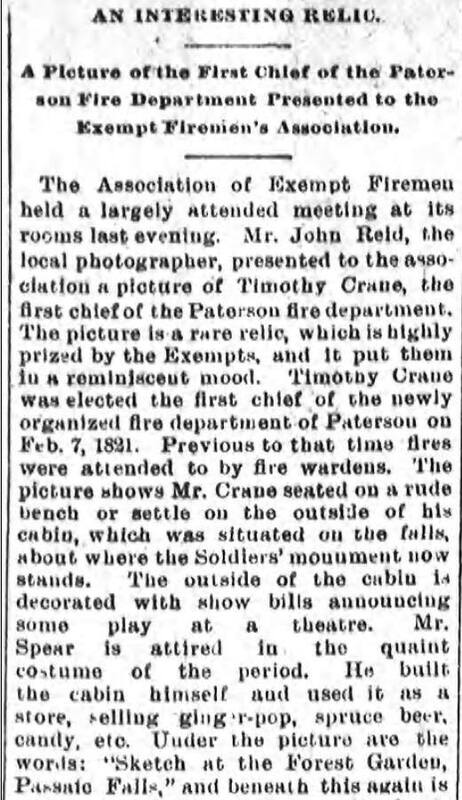 N.Y. to Exempt Firemen's Association of Paterson, NJ, January 25, 1890. Above the adjoining mantel is another work by J.W. Russel executed for Lafayette Engine Company No. 8, which is considered by many as Russell's masterpiece. It is a set of resolutions on the death of William A. Harrold, a member of the company. The design consists of views of a burning bell tower and a broken fire alarm pole which convey a forcible impression of the end of all things. Flowers and palms interwoven with the wording of the resolutions make a beautiful background of the work. J. Stevenson, Second Lieutenant Robert Parmley First Sergeant William H. Norris, Sergeant Andrew Doremus, Sergeant Edward Swift, Sergeant Thomas Maher, Henry Coyle, William H. Post, Charles Spittel, Andrew Clark, John Singland, Robert Enkins, Francis D. Clinton, Wiliam Skinner and Albert C. Doremus, all of whom were members of Neptune Engine Company No. 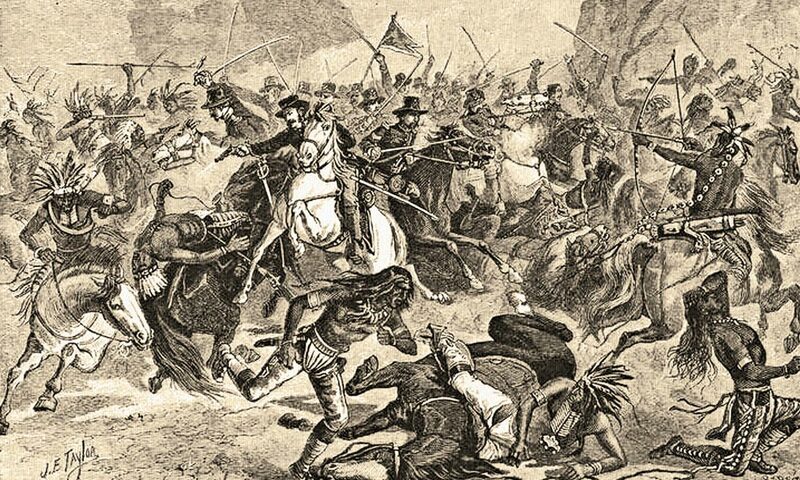 2, who organized Company C, Twenty-fifth regiment, New Jersey Volunteers, all of whom returned to Paterson except William Skinner, who was killed at the battle of Suffolk, VA., on May 3, 1863. Francis DeWitt Clinton was wounded and suffered the loss of his leg at the Battle of Fredericksburg, VA, on December 13, 1862. ​​In an eight-foot frame is the life size portrait of John MacDonald, who was Chief of the fire department in 1883-1884, and was at the time of death, in 1894, was one of the police commissioners of Paterson. 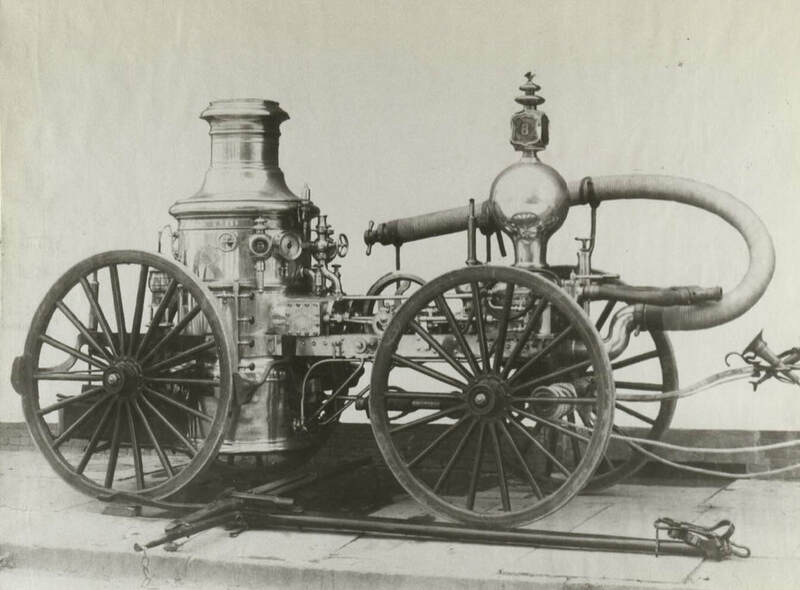 company of the city of Prague, Austria; Firemen's Monument at Havana, Cuba; scenes in connection with the Exempts excursion to Philadelphia in 1901; old steamer 3 at work and a picture of an ancient fire engine of Nova Scotia. ​Beautifully engrossed resolutions from C.M. Leonard Steamer Company No. 2 of Newburgh, N.Y., to Hibernia Hose Company No. 3 of Paterson; Vigilant Engine company No. 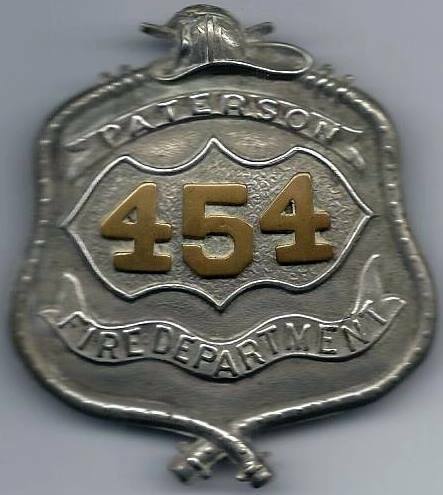 2 of Dover, N.J., to Paterson Steam Fire Engine Company No. 1 of Paterson are displayed on the north side of the room. Tastefully arranged throughout the rooms are models of fire apparatus, floral decorations, statuary, hat fronts, bells and many other firemanic emblems. The furnishings of this room is of a simple character. Numerous cane-seat armchairs of a comfortable pattern comprise the only furniture. A large fireproof safe stands at one side. Above the safe a large size statute of General Washington overlooks the room. The walls on three side are taken up with the portraits of the chiefs of the volunteer department. 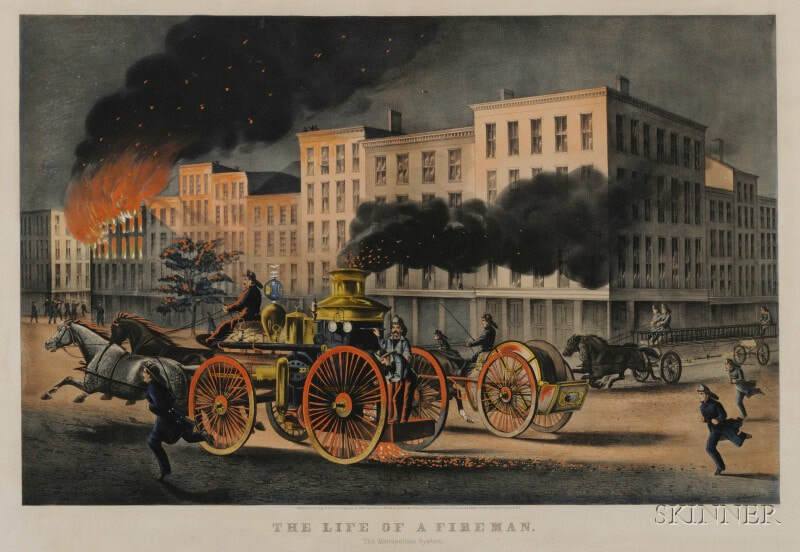 This notable array of old fire fighters consists of Timothy B. Crane, firre chief of the department and chief in 1821-'22-'21-'25 and 1826; Nathaniel Lane, 1838-'9, '42-'43-'44-'45 and 1847; John Bowering, 1857-'58; James McKiernan, 1861; Edward Swift, 1863; Andrew Moser, 1867; John McKiernand, 1868; Edward Core, 1870; William C. Martin, 1972; James I. King, 1873-'74; John E. Regner, 1875--'76; David I. Turnbull, 1877-'78; Bartholomew Reilly, 1879-'80; Leonard Garrison 1881-'82; John MacDonald, 1883-'84; James Kearney, 1885-'86 and John F. Murphy, 1890-9'91. A pen sketch of the first fire alarm card hangs at one side. ​A pen sketch of the first fire alarm card hangs at one side. A border of hat fronts has been arranged around the room, mixing up the numbers producing a novel effect., while hose pipes are placed at every angle of the room. The wall on the south side is taken up with a bulletin board, suspended over which is a magnificent pair of deer antlers supporting two crossed trumpets. No attempt has been made to decorate this apartment, the room being mainly used for the purpose the name implies. The principle article here is an extra size stationary range that has frequently been out to use for festive occasions. A busy scene was enacted at the time of the great fire. 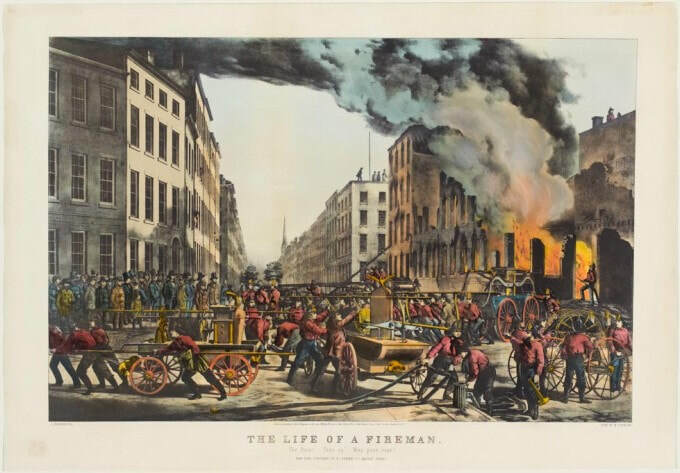 While some of the members manned a line of hose to protect the quarters of the Exempts and adjoining buildings, others were engaged in preparing coffee and sandwiches to supply the hundreds of firemen of this city and adjacent cities and towns. A pantry adjoining the kitchen is well stocked with tableware and culinary utensils. The largest relic of the Exempts, and for which this room has been especially fitted, is the first steam fire engine used in Paterson. This old veteran is of the single pump class and was built by William Jeffers of Pawtucket, R.I. It was received in this city on July 4, 1864, and was continued in service by Engine Company No. 3 for eighteen years, when it was retired for a larger engine and sold to the Passaic Water company, who used it for pumping out cellars and for other purposes. The water company having no further use for the engine, presented it to the Exempts. The boys have overhauled the old machine and placed it in working order. ​At a trial test at the race on Easter Monday, 1902, in which the whole membership of the association took part, assisted by several hundred citizens, the old "sawing-machine" proved itself worthy of its early record. 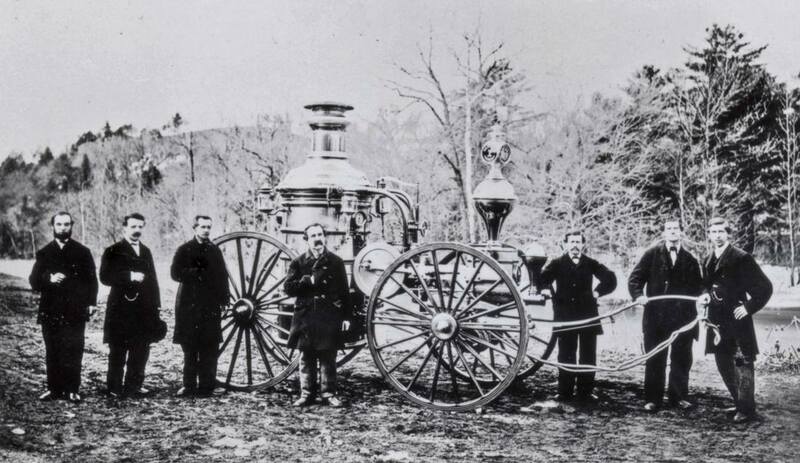 The introduction of the steamer to the fire services caused a wave of excitement to roll over the fire department. The firemen were loyal to their volunteer organization and many feared that the advent of steam would break up their system; but at a number of large fires the advantage of steam over muscle was shown to such an extent that the other companies soon fell in line to secure steamers. ​The relics in this room consist of two views of the ruins of the Roger's Locomotive and Machine Works, destroyed February 13, 1879; picture of Franklin Engine No. 3 of Brooklyn, two pictures of the Life of a Fireman, old goose-neck No. 1, first style of Amoskeag steamer, pictures showing the ruins of Conmaugh Steamer No. 1 of Johnstown, PA., destroyed at the time of the great flood in that city; a group picture of John E. Regner, Barholomew Reilly and Frederick Wieler, chief and assistants in 1875-'76, and a large photograph of Admiral Dewey. The other articles consist of service trumpets, signal lamps, hat fronts and belts. A rifle barrel from the ruins of the Van Winkle hardware store fire recalls the great fire of February 9, 1902. 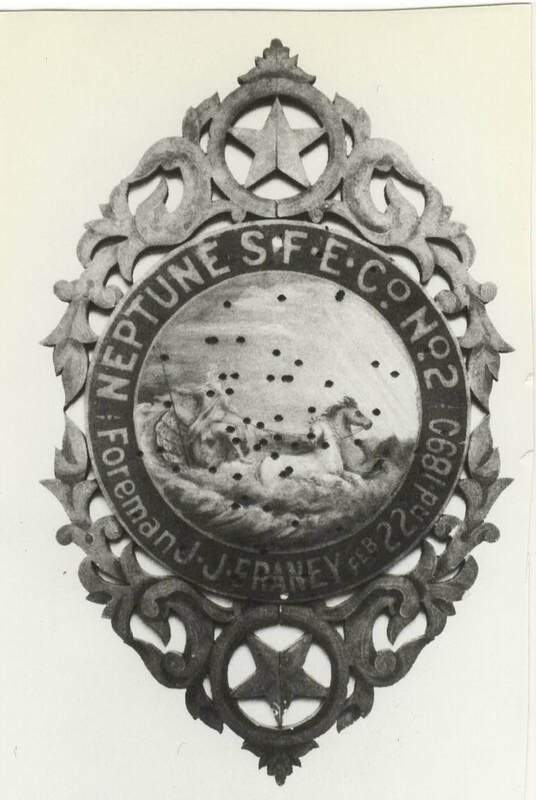 A wooden target at one side reminds the boys of the last outing of a volunteer company, which affair was under the auspices of Neptune Engine No 2. James J. Franey, foreman at Kearney, N.J., February 22, 1890. The well-riddled appearances of the target indicates the firemen could handle the rifle as well as the hose nozzle. ​The first object in view is a large leather shield of beautiful design, which was presented by Washington Hook and Ladder Company No. 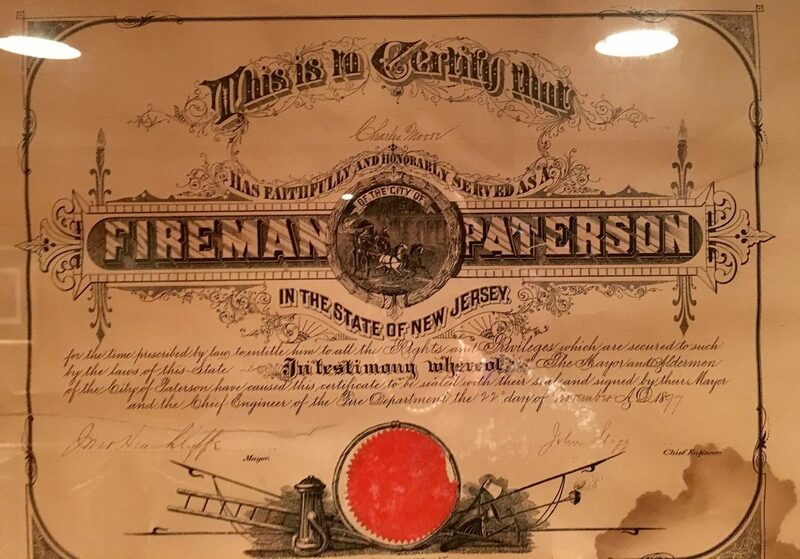 1 of Guttenberg, N.J. to Germania Hook and Ladder Company 2 of Paterson. ​Nearby is a picture of Steamer No. 7, Clapp and Jones make. 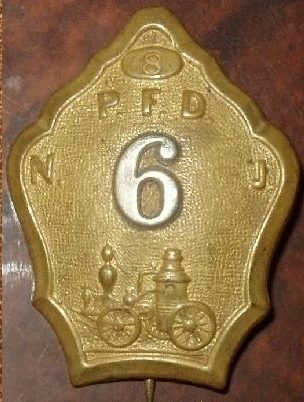 A large leather shield of Greenpoint, N.Y., presented to Vigilant Steam Fire Engine Company No. 6 of Paterson. and a beautifully engrossed set of resolutions from Knickerbocker Steamer company No. 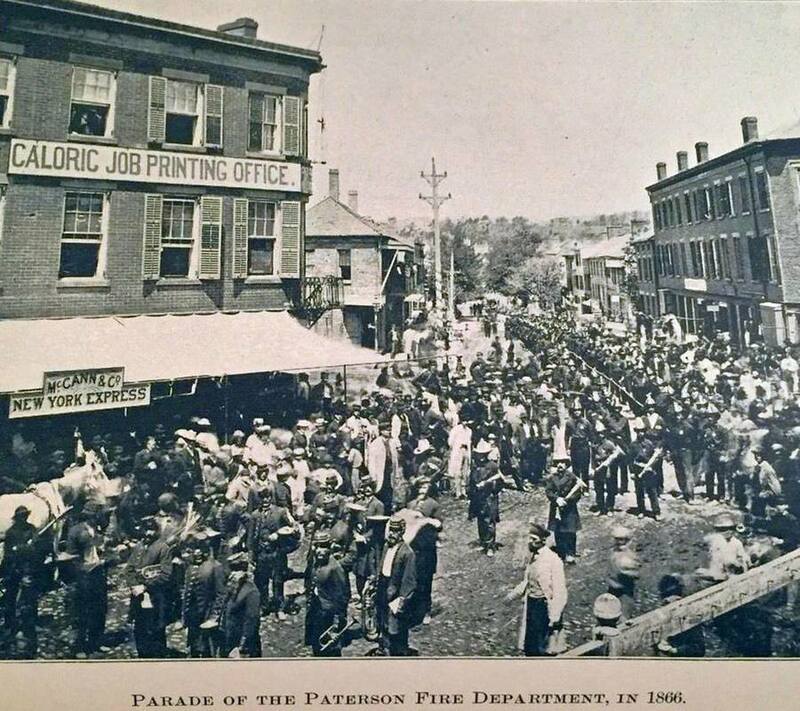 1 of Waterford, N.Y., to Passaic Steam Fire Engine Company No. 1 of Paterson are displayed. A number of Exempt certificates closes the list in the hall. The visitor on entering here is at first at a loss which way to turn in order to view the many objects before him. 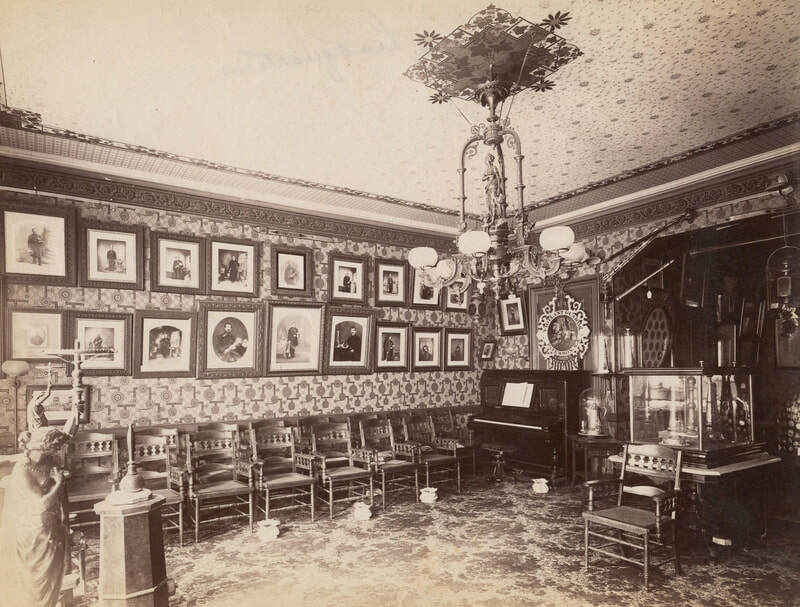 This parlor while not as large as the one on the first floor, contains more articles and of a different character, each one so arranged as to show to the best advantages and the whole forming a charming series of pictures. On a marble-top table rests a large glass case containing one gold and two silver parade trumpets, the gift of Vigilant Engine Co. No. 6. A score of minor articles have been placed in the cases, each one having an interesting history connected with it. ​Liberty Fire Company No. 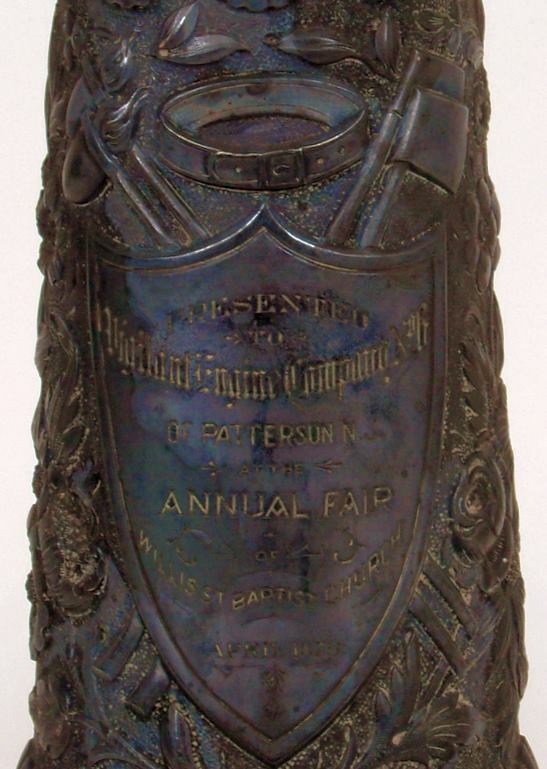 5 of Reading, PA., visited Paterson on Sunday, September, 3, 1899, as the guests of the Exempts and the visitors, in return for the hospitality extended to them, presented the association with a silver loving cup. 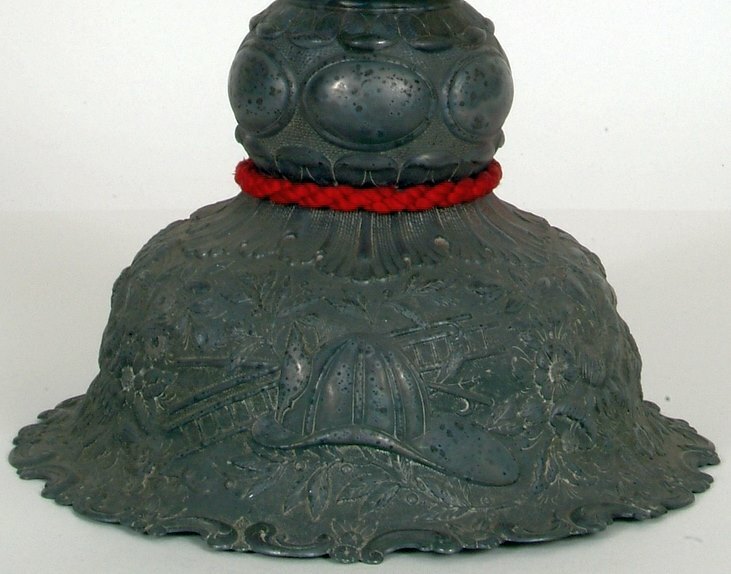 The cup is of a beautiful design and is about 20 inches high. On one side a line of hose is looped through a ladder, anfd suspended from the hose and ladder are the several emblems of the fire service - trumpets, fire hat, lantern, axes, etc. On a panel on one side is shown a steamer in action; on the reverse sideof the cup is shown a hose company going to a fire. On the lower panel is the date of the presentation, March 17, 1900. In a huge glass globe presented by Neptune Engine Company No. 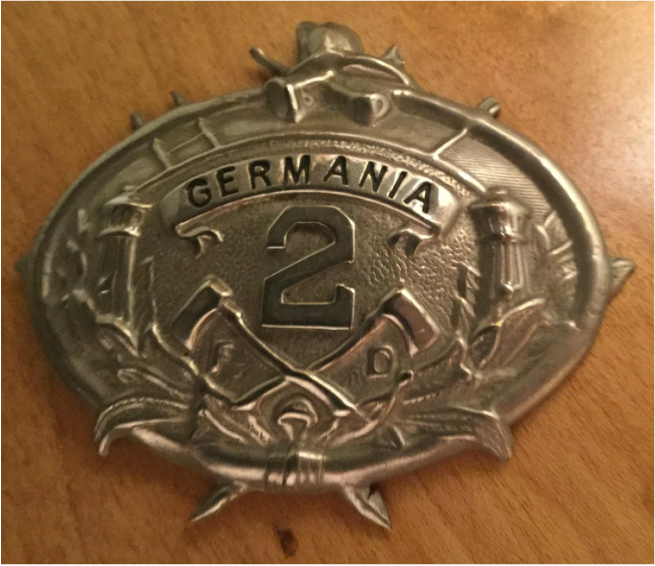 2 are hundreds of metal badges of fire associations and of American and European Fire Departments. 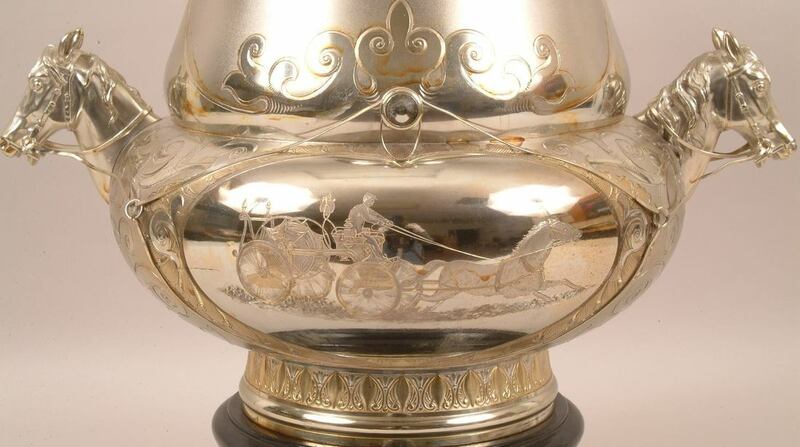 A pretty ornament that is always given a close inspection is a shooting trophy presented by L.A. Piaget to Engine companies 1, 2, 3 and 5 at the time of their joint excursion to New Brunswick on Thanksgiving day, 1881. The cup was shot for on the following Monday at Passaic Falls and was won by the team from No.5. the following teams competing: From No. 1, Robert Downie, Michael Carney, Thomas McLean, Henry Schoonmaker; No. 2, Isaac Coppon, James F. Zeluff, George W. Dobson, Samuel Arden; No. 3, Joseph Chapman, Isaac H. Garrabrant, Neil Jordan, Christian Stock; No. 5 William C. Martin, James King, Frank D.H. Snyder, Benajah Beardsley. 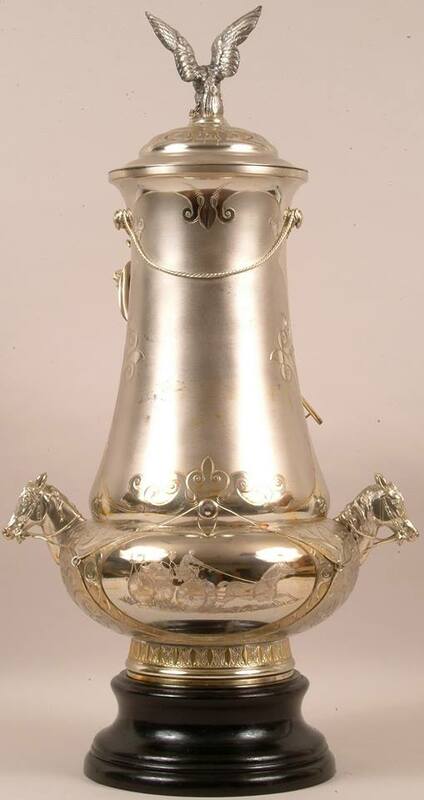 The trophy is of sterling silver and of superior workmanship, and stands about eighteen inches high. Four stacked rifles resting on a base support a vase surmounted by a rifleman in actions, the names of the winning team being engraved in a panel on the vase. At one side of the room are the metal covers of the parade reel and two nickel plated play pipes of Cataract Hose carriage No. 2, which by being in an out-building escaped destruction at the time of the burning of the house and apparatus of that company, on November 9, 1888. Relics of the fire in question are the hammer and striker of the 20-inch fire alarm installed in that hose house. 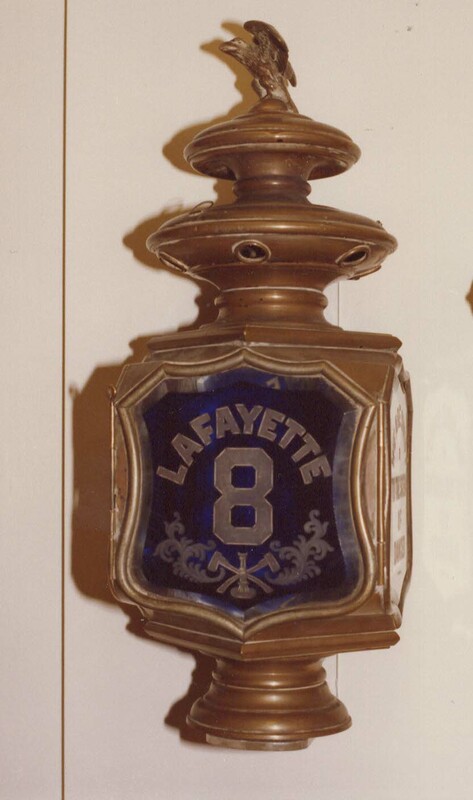 At the exhibition of fire alarm systems at the Philadelphia exposition in 1876, the Gamewell Fire Alarm Telegraph company was awarded first prize for this gong. ​The Spanish War is brought to mind by the log book and purser's book of the Spanish gunboat Gorg de Juan, sunk by the United States cruiser Wasp at Nipe, Cuba, July 23, 1893. These books were recovered and presented to the association by William Kelley, a Paterson boy who was a gunner's mate on the Wasp. ​Other military relics in this department consist of a rifle barrel of the first battalion, N.G.N.J., taken from the ruins of the great fire of Washington Hall - the last fire of any pretensions combatted by the volunteer department. 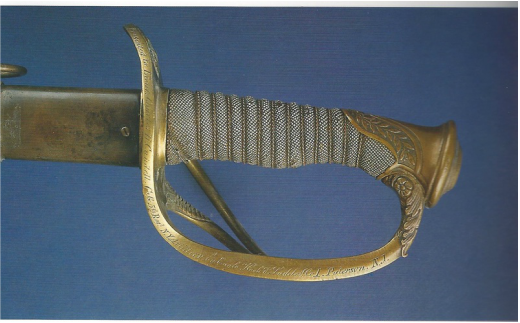 An antiquated firearm in the same corner was captured from an Indian shortly after the massacre of General Custer and his command at the battle of Rosebud, June 27, 1876, and is supposed to have been used in that engagement. ​​Suspended from the gun is a cartridge box that was carried through the civil war by a Jersey City fireman. ​Two brass torches from Engine Company No. 1 recalls some of the difficulties of the early days of the department, when the companies in route to the fires had boys running ahead of them with torches to guide them through the dark streets. It is a matter of pride with many of the old vets to refer back to the days when they served in the capacity of torch boys. One veteran in particular, who is a resident of Newark, makes it a duty when on a visit to Paterson to call at the Exempts' rooms and look at the torches, which he claims to have carried on many eventful occasions over sixty years ago. 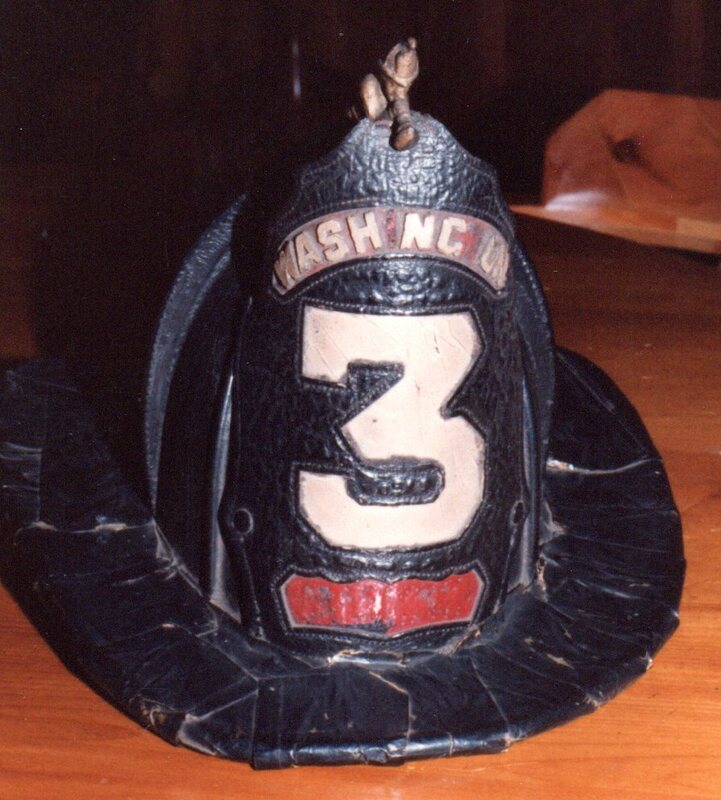 A service play pipe from Engine Company No. 3 has quite a history connected with it. At the times of the burning of the Adams Mills, on February 6, 1887. the pipe was crushed buy a faling wall and a number of men were injured. The company had the pipe restored to shape and presented it to the association. 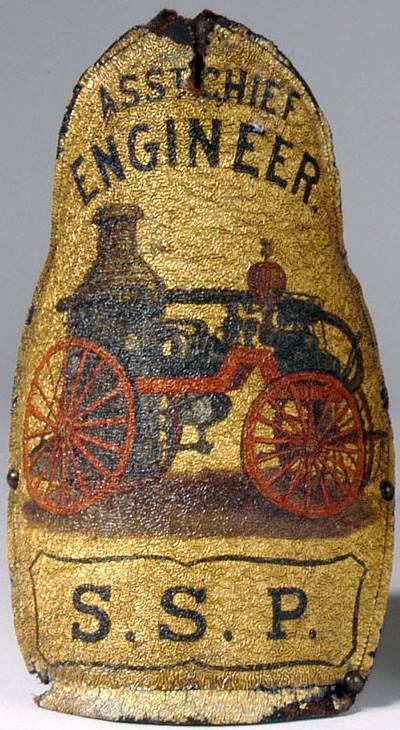 The name of the pipe used by Engine Company No. 5 at he great fore of February 9, 1902. 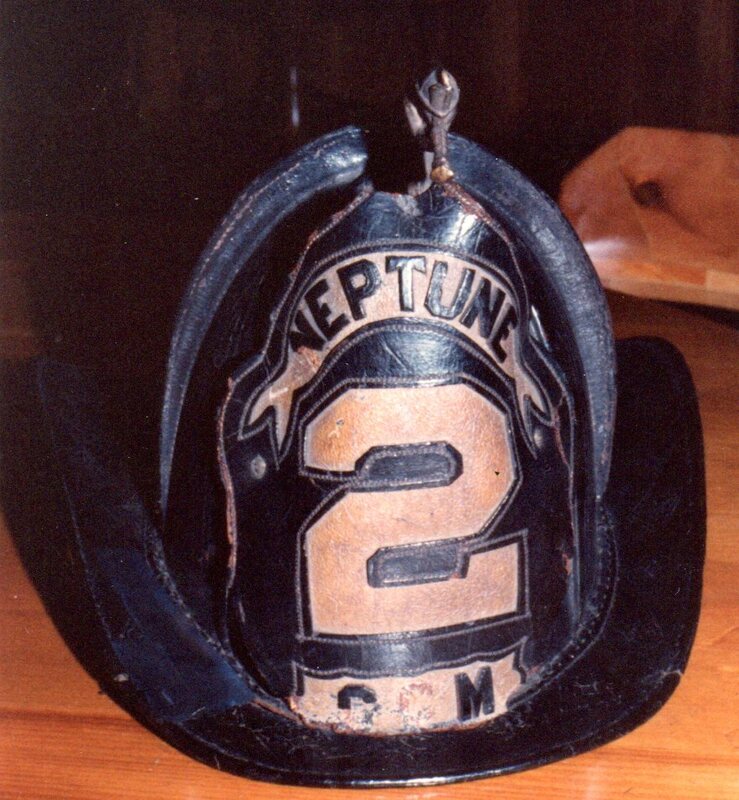 Goose-neck Pumper of Neptune No. 2, nicknamed "Growler"
Some of the companies had pet names for their machines, such as Black Hawk for No. 1; Growler No. 2, John Street Ghost for No. 4; Mickey Four, and old Hickory for No. 4; Potcheese, No. 5. The other companies did not follow the custom, although nearly all adopted some motto. The following from No. 4 is a specimen: "We ask for what is right, and submit to nothing wrong." For those who desire a game of dominance or cards, this room has been comfortably fitted up for their pleasure, often a number of games being underway at the game time. Many of the boys delight to sit around and watch the games and jolly the players, and each one receives his share as the game progresses. In keeping with the old times, a prominent feature in this room is a large picture giving a bird's eye view of Paterson as it was in the fifties. This picture is often referred to by some of the old timers, and they point out the location of some of the buildings in which they fought some of the big fires in the early days. ​On the opposite side of the room are six pictures designated as the old style and the new. The first shows a race between White Turtle and the Red Crab, two of Philadelphia's hose companies, the Northern Liberty and Lafayette, that were famous over a century ago. This is a rare picture, and as nearly can be learned there are only a few copies in existence. The next picture is that of the old goose-neck engine No. 2 (pictured above); then a picture of the piano deck engine (below), No 6, (below) followed by one of steamer No. 3, the first steamer of the department (below). ​The two other pictures show Engine 1 of the present department and the hose wagon, each with horses attached, ready for service. 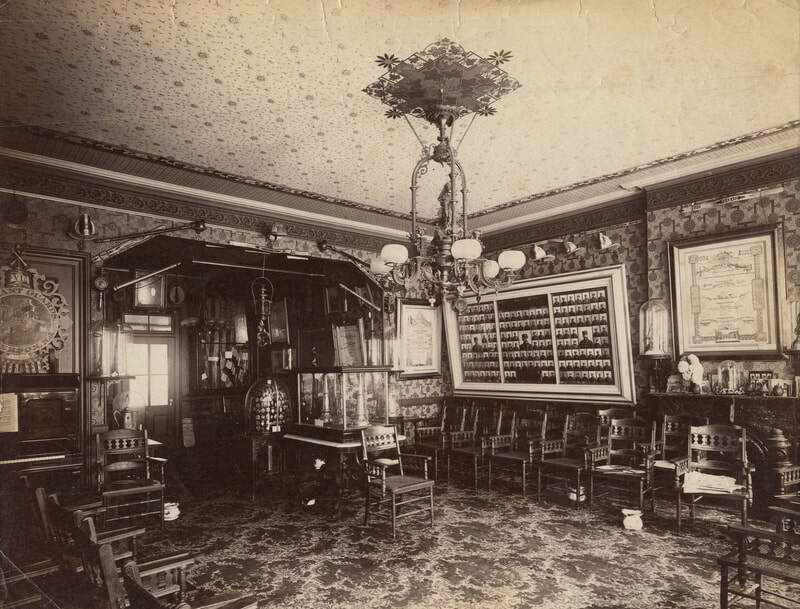 ​The other pictures in this room are one of Lieutenant Thomas Agnew and Corporal John E. Clark, of Company G, Seventh Regiment, New Jersey Volunteers who went to the front in 1861 and served during the war; William Lendrim, foreman of Truck No. 1, and Gustave Specht, foreman of Truck No. 2, of the volunteer department; a group picture of the San Francisco Cal., Exempt Association; old Truck No. 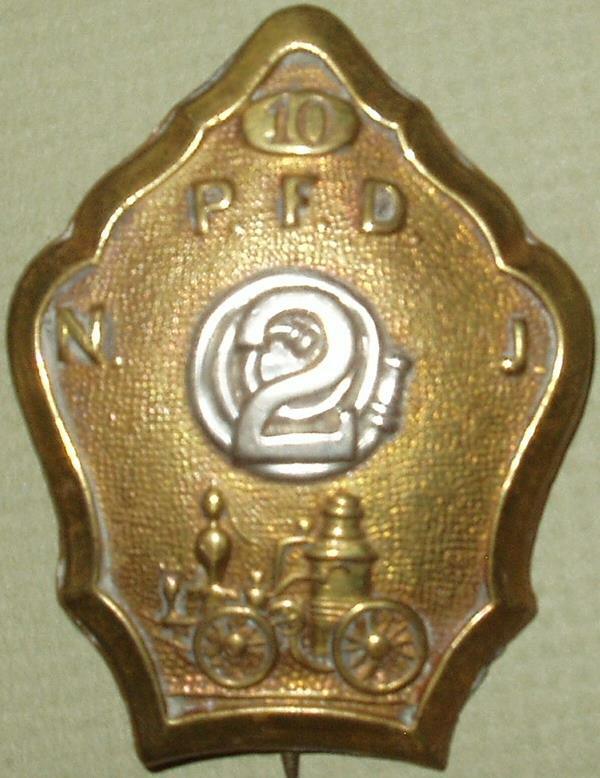 1 and pictures of miniature fire apparatus made by Patrick Mead of the New York department. 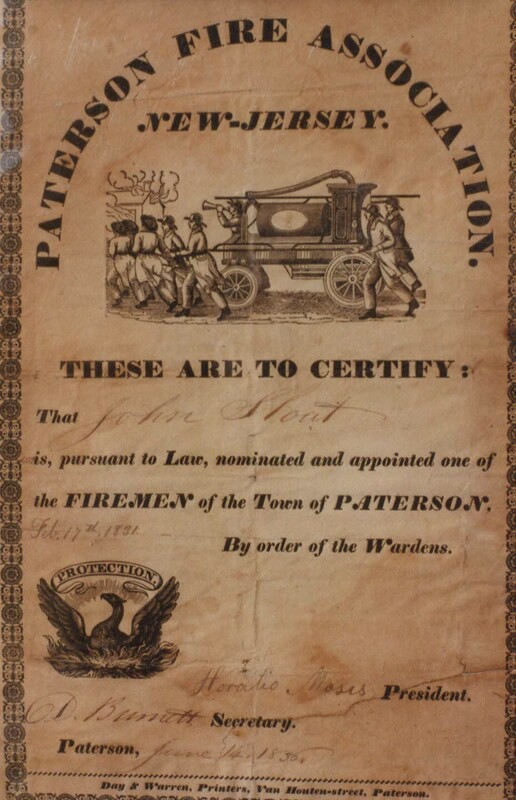 A curious collection are the old certificates issued by the Paterson Fire Wardens. These certificates, which are quite a novelty, are six inches in size, surrounded by an ornamental border. 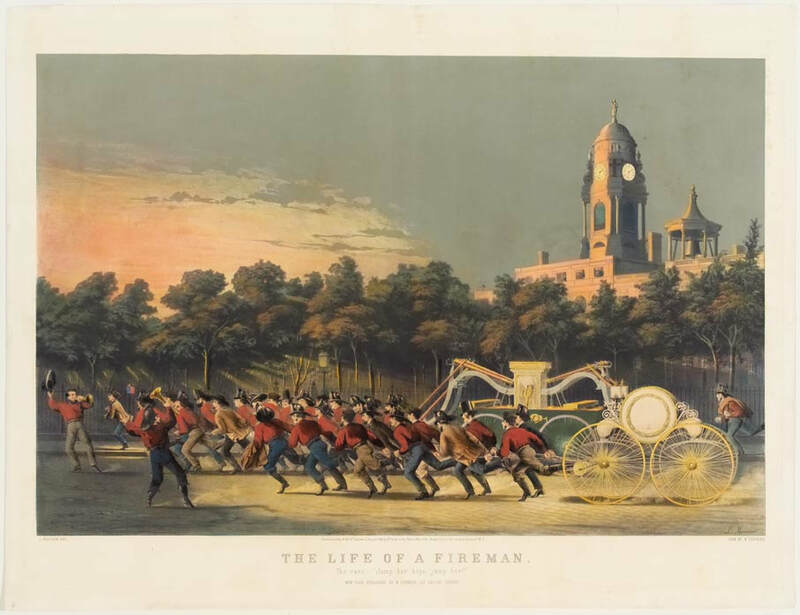 The upper part shows a wood-cut of a fire company in full uniform dragging their engine to a fire which is shown in the distance. The seal represents the bird of fable, the phoenix, arising from the flames. 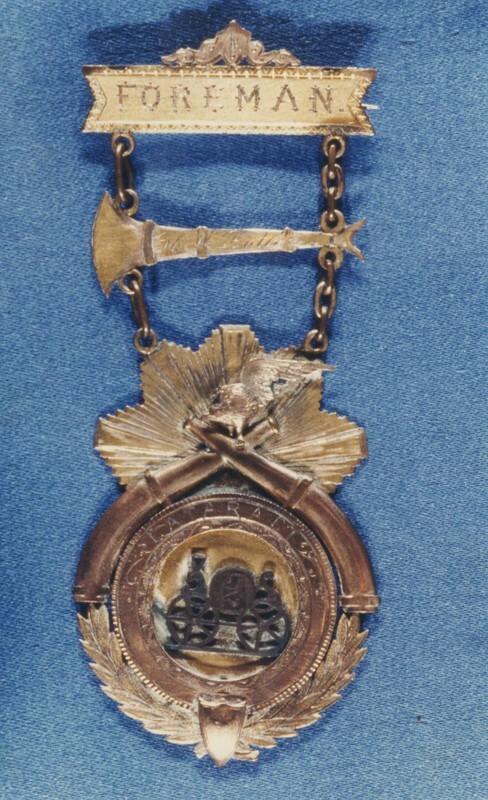 Just above the seal is a scroll bearing the word "Protection." 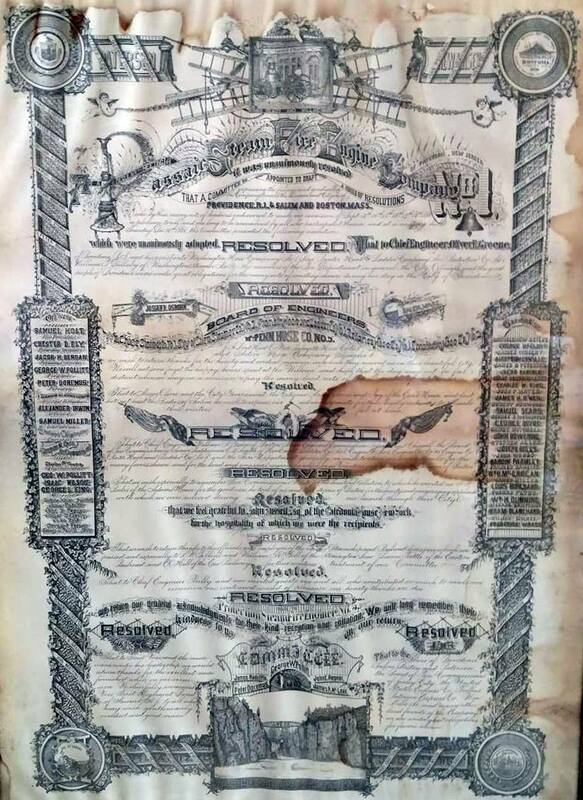 The names on the certificate are: Nathaniel Lane, July 1, 1828; Cornelius L. King, July 1, 1828; William Sedden, September 25, 1835; John Sloat, June 14, 1836; David Beam.March 20, 1840; Frederick Hanson, September 21, 1846; John Farnon, January 21, 1847; Thomas Farnon, April 30, 1855. 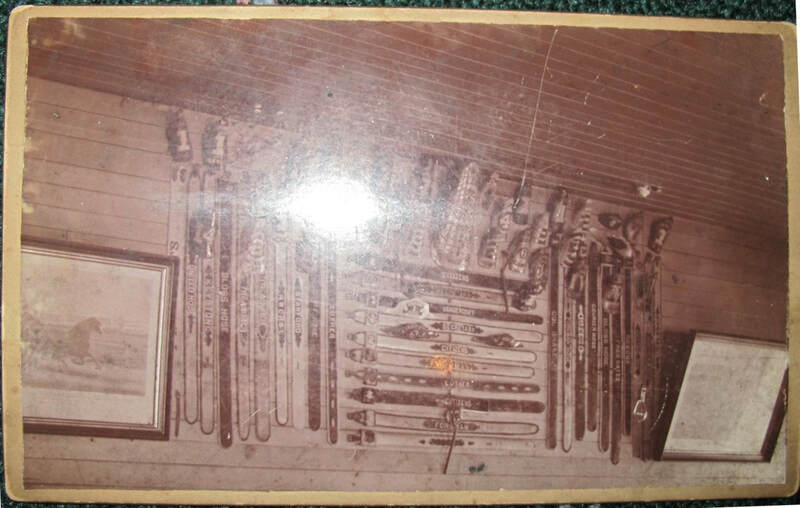 The list of other articles in the room is made up with parts of fire apparatus, trumpets, belts, fatigue caps, axes, certificates and resolutions. ​In a neat little frame are the following rules that were in operation in the house of Truck 1 in 1858: The last two lines reminds delinquents that the chief would take active measures to enforce order by closing up the house. ​ Our good name we'l maintain. ​ And keep your self respect. ​ And a padlock in the morning. ​This room is considered the costliest one of the entire set. A large plush covered table and a score of arm chairs comprises the furnishing. Fire hats are arranged all around with great care. 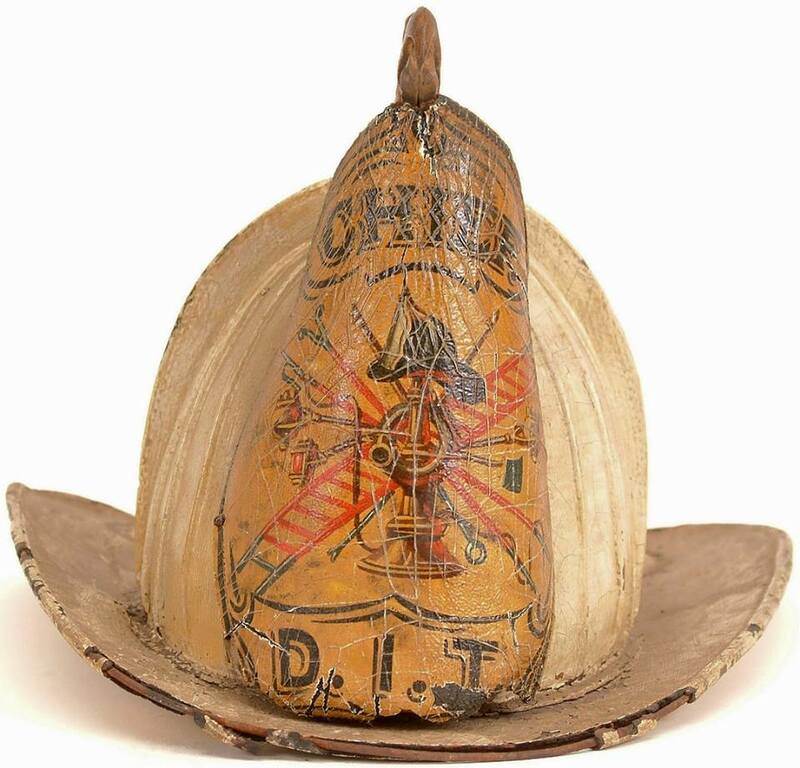 Two queer shaped hats from Philadelphia, one of them dating back to 1747 and a peculiar shaped head gear over 90 years old, from the Sun Fire Company of Charleston, S.C., attract much attention. On one side of the room hangs a large glass case filled with all kinds of fire emblems (badges). 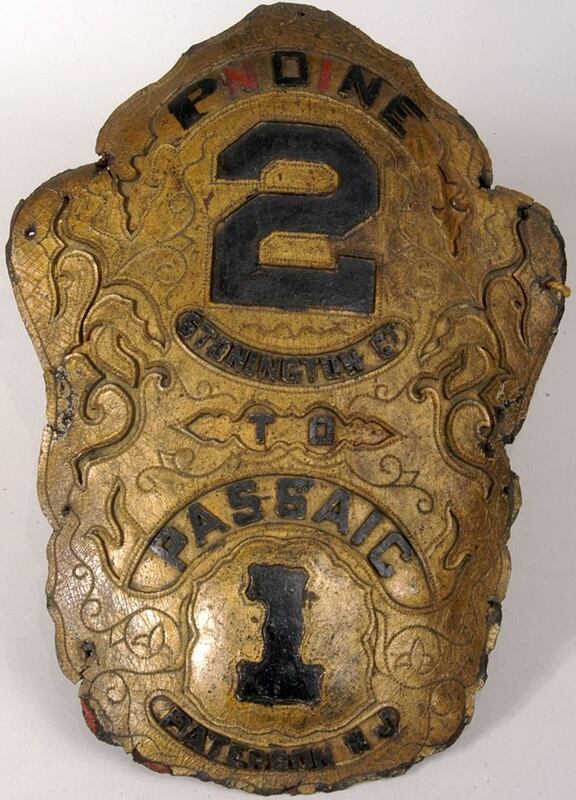 ​This case was the gift of H.F. Simmons, an enthusiastic fireman of Passaic. 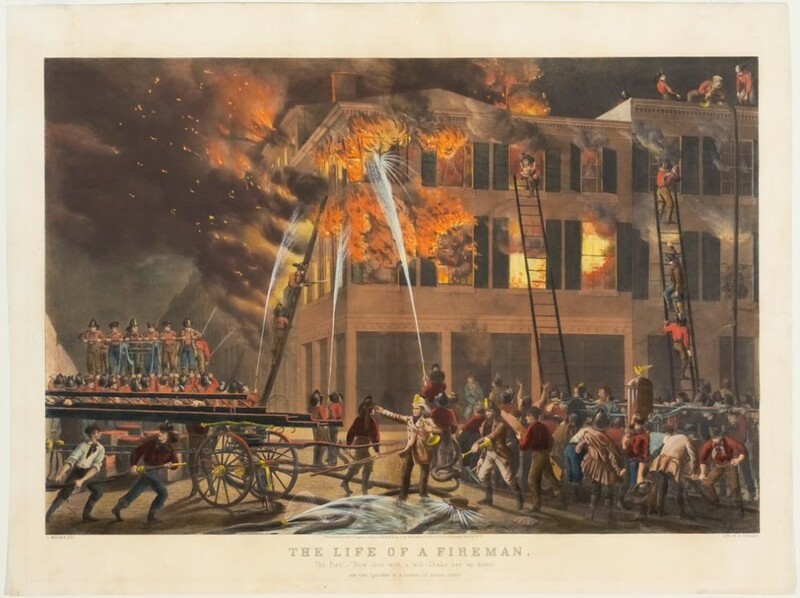 ​ A net of large pictures, the gift of President John McKiernan of Currier and Ives lithographs illustrates the life of a volunteer firemen - first the midnight alarm, company leaving quarters; the second, the race showing the rivalry of two companies on their way to a fire; the third, the fire with firemen in action; the fourth, the ruins and taken up; fifth, stream vs. muscle, a contest between steamers and hand engines; sixth, the new style, showing a steamer, truck and hose cart on the way to a fire. A large oil painting of the burning of the Potter building, New York, January 31, 1882; picture of hand engine No. 5 and a portrait of George Boss of Engine 1. together with a case of birds, closes up the list of articles here. The library contains over two hundred volumes, many of the books being of historical value. 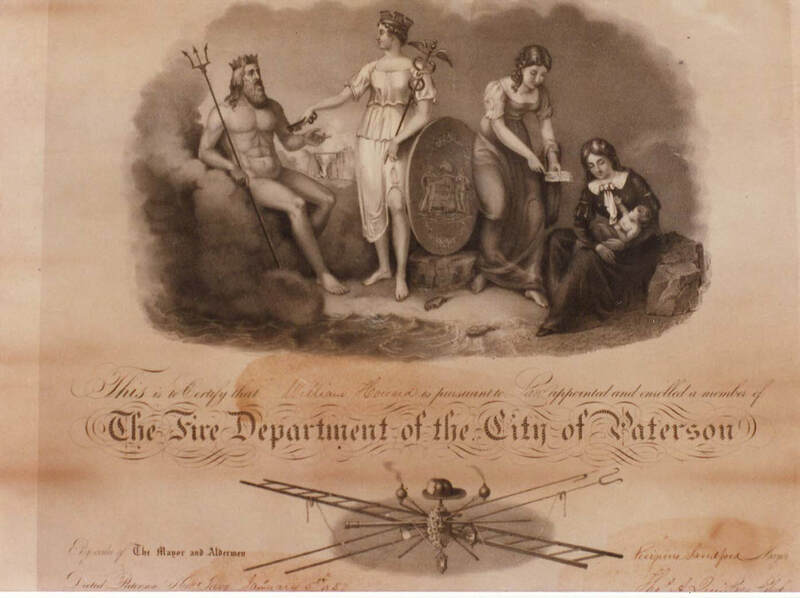 The two huge volumes, the gift of Richard Evans, contain the complete record of every Jersey-man who participated in the military and naval service of the United States during the civil war. Two other volumes that are very interesting are the New York Fireman, published in 1840-41. The younger generation derive a great deal of amusement in looking over these papers as they contain many quaint comments on the fire service of that period. ​The committee who were appointed to purchase an engine, report to the board that they have engaged of Ep Force of New York, an engine of none inch chamber, playing from one or two pipes at once at pleasure, which engine is represented to them as a most excellent one and well calculated for the purpose designed. And that the price is to be eight hundred and fify dollars for said engine, with double sets of screw pipes, etc. All in complete order. The engine was placed in commission with Engine Company No. 1 on May 29, 1822, the following named men comprising the company; John Rutan, David Wilson, Daniel Sharp, John G. Brower, Anthony Van Blarcom, Jams Warren, Abraham Duvall, Thomas Kennedy, Patrick Butler, William Johnson, James McMillan, William Day, Simeon Garrison, John Deets, William Lanner, John M. Crane, John Benson, Stephen Waring, Moses Parker, George F. Curran, John Van Iderstine, William Kennedy, John Massacker, William Johnston, Jr., James Johnston, Peter Cooper, James Crawford, John Gilbert, James S. Hutton and Peter Sine. 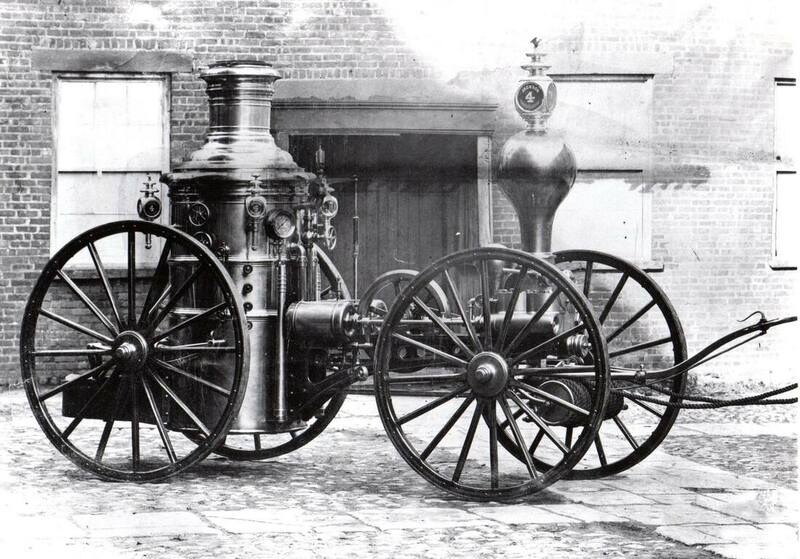 ​The engine was continued in service until June, 1835, when it was replaced by a smaller one. There is no record of when the engine left Paterson. 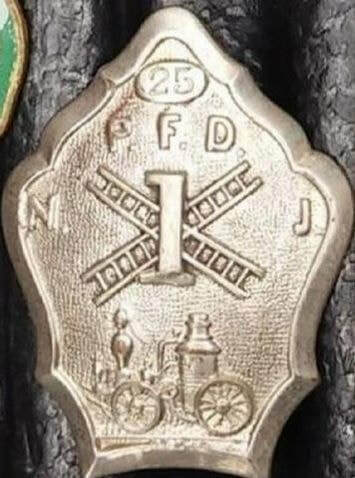 At a meeting of the wardens on January 31, 1835 they had under consideration an offer of four hundred dollars that the New Jersey Iron company had made for the engine. The engine remained at Boonton until 1852, when it was secured by No.1's company, who at their annual reunion in 1894 voted to present it to the Exempts. 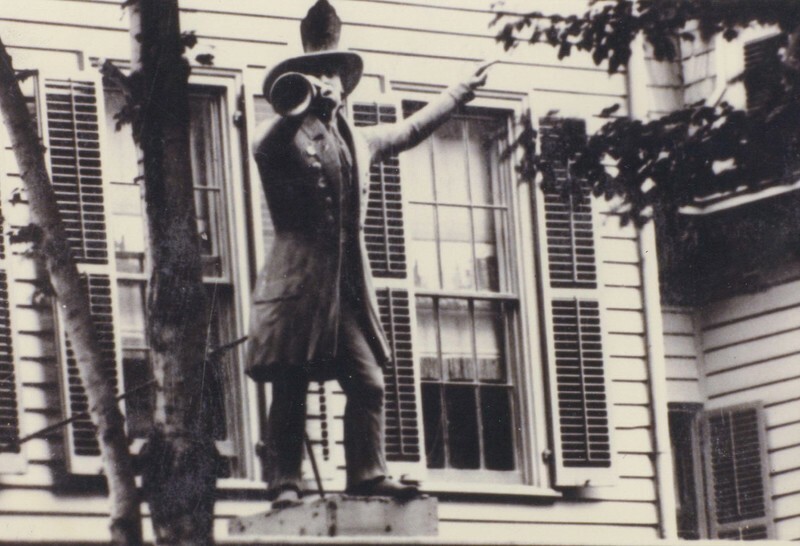 ​As one passes along Clark Street, the first object brought to view, indicating the character of the Exempt quarters is the stalwart figure of the fireman standing over the front plaza of the building. 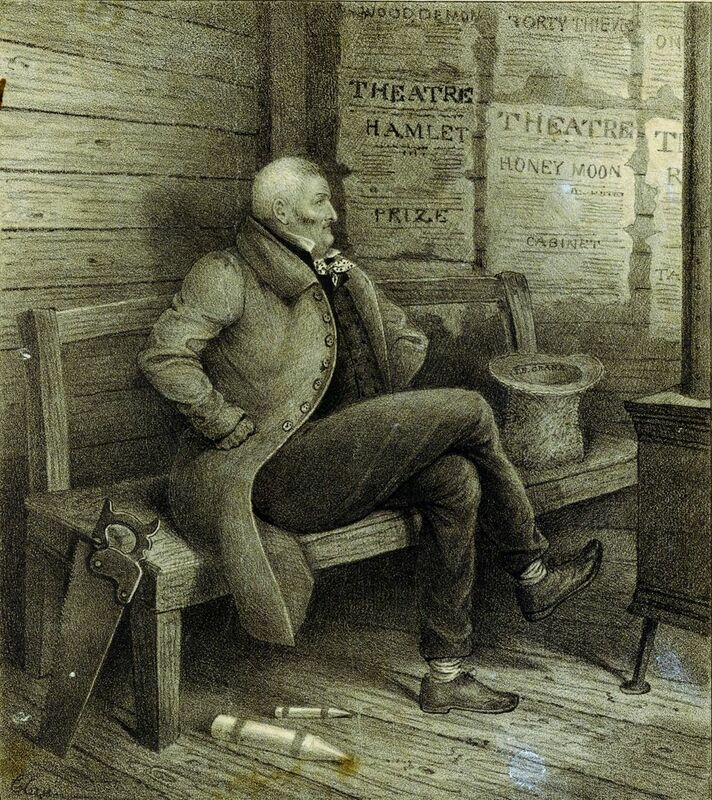 While accounts have been written at various times how the figure was first brought to Paterson, the active participants of the affair, many of whom are yet in existence, have very little to say concerning it. The history of the figure as near as can be learned is thatr it originally stood on the house of Harry Howard Hose Company, No. 55 in Christopher street, New York and was brought to this city during the sixties, through a scheme engineered by Billy Dodds and others of No. 55 company, assisted by several of No. 2's men. When the figure reached Paterson it was hidden under a pile of hay in the brick barn on Ward street, at the head of clark street, for several weeks. In the meantime, paties from New York were scouring the town, seeking some trace of it. After th excitement incident to the removal from New York had subsided, it was placed in position on the roof of No. 2's house and remained there until the disbandment of that company in 1875, when it was secured by Protection No. 5's company and placed on their house. 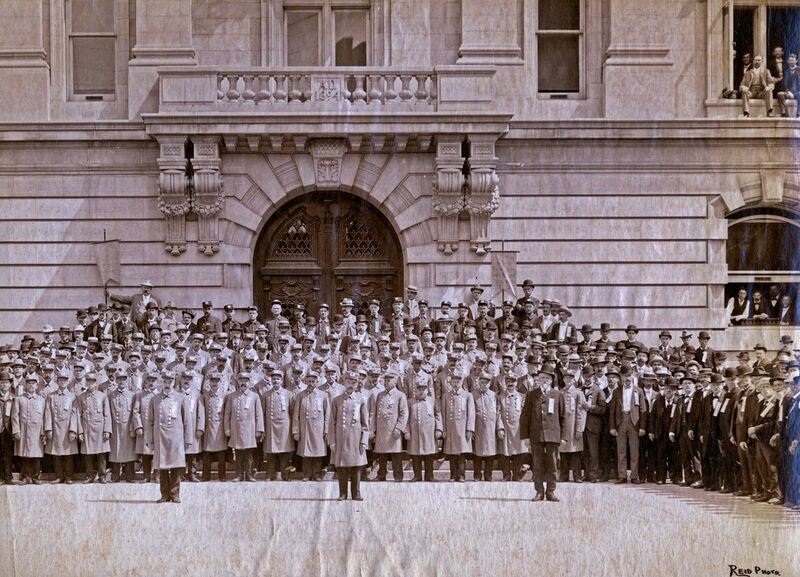 When the volunteer department went out of service in 1890, No. 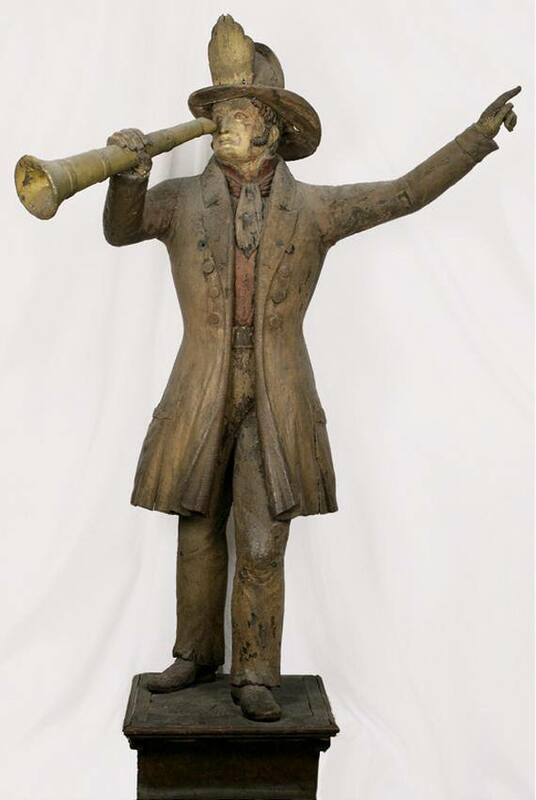 5's company donated the figure to the Exempt association on whose building it has secured a final resting place. The Exempts regard the figure very highly, as one of the links that bonds them to the memories of the past. ​Resolved. That while we hold ourselves ready at all times to render all assistance in our power in subduing the destructive element of fires which so often make havoc on the property of our fellow-citizens, we deem it their bounden duty to authorize the board of fire wardens (if they have not the authority) to supply us with proper refreshments during the prevalence of fires. ​Resolved. In the opinion of fireman an anniversary meeting should be held by them on which occasion all the engines full manned and in perfect order, should be exhibited to their fellow citizens, and that a sum of no less than fifty cents per man should be appropriated to defray expenses incidental thereto. ​Resolved. That whatever may be the decision of our fellow-citizens or of the board of wardens in relation to these resolutions, we are determined to do our duty, and whilst we are satisfied from past experience that a compliance with them will be as politic as it would be liberal and just, we cannot but be persuaded that they will meet the cordial approbation of the wardens and the sanction of our fellow-citizens. ​The chief engineer laid before the board a communication he had received from the Engine Company No. 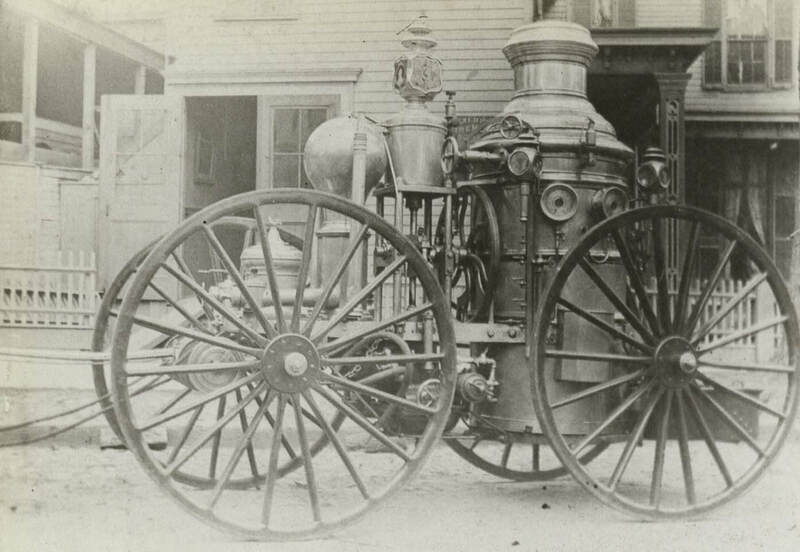 1 stating that one of the companies from Brooklyn with their engine was about to visit Paterson, and wished to have the views of the wardens on the propriety of turning out a company to receive them. 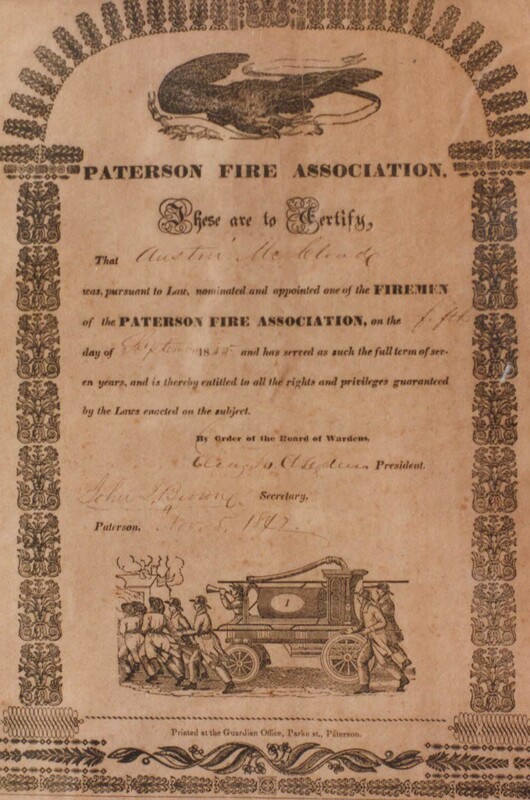 A copy of the resolutions passed by the board of fire wardens of Paterson, September 12, 1842: A letter being presented to the board by the chief engineer received from the secretary of Engine Company No. 1, informing him that members of the Eagle Fire Company No. 4 of Brooklyn City contemplates visiting this place on the 20th instant, and requesting him to invite the board of wardens to join in their reception: The Board upon full and deliberate consideration thereof do resolve that in their judgment it will be inexpedient for them to commence a public celebration or to join any proceedings which may be calculated to create excitement, and that while on the one hand, under other circumstances, their feelings would lead them to extend due courtesy and hospitality to a company from a neighboring city, yet on the other hand and at the present time, that their duty towards this community compels them respectfully but earnestly to request the foremen of the several companies of this department not to exhibit their respective engines in a procession on that occasion, nor to permit any acts to be dine by their companies which might tend to awaken the malice of the incendiaries by whom our town is undoubtedly infested, and lead them to a repeated indulgence of their lawless and cruel practices. Resolved. That a copy of this proceeding be furnished to the chief engineer and to the foremen of each fire company of the department. ​In concluding this sketch, it is only fair to state that the portion of the story concerning the relics in the exempt headquarters is only suggested, not told, for every room in the staid old building is rich with relics of the past and show the long journey of equipages from the early days of the volunteer firemen to the present time. They have all played their part in the vicissitudes of a fireman's life and have long since been supplanted by the most modern. To the old fireman this curiosity shop, this museum of obsolete and discarded relics, is a never ending source of pleasure, for it brings back vividly many stirring scenes that have been enacted in volunteer days.